It is difficult to astonish an experienced user by Internet possibilities of the satellite maps, but those who see them at first most certainly will be interested and spend a long time at a computer or tablet computer in search of images of interest. The images of the Earth on the interactive map, where by	using control panel you can zoom practically each point of the planet, draw the eye. However modern maps include not only satellite photographs, but panoramic images, by which you can examine items on the planetary surface in tridimensional design, in other words to walk the streets and see houses, people, and vehicles. You will be very much taken with the whole process of such a travel, and moving through the virtual streets looks like on-line game. Information in itself related to the Earth interests everybody. For example, when you have common terrestrial globe before you and a few minutes of spare time, most certainly you will start rotation of the globe in search of countries and cities, sees and deserts. 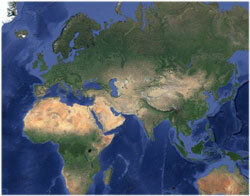 However how can you compare a globe with a satellite map? It's most likely that now there is no other internet service, which can offer such immense amount of useful and detailed information to the user. Satellite maps may be used not only out of curiosity, but for acquiring practical and useful information. Everyone can share photographs found on the map with friends. At the present time land measurements using satellite map, keeping track of vehicles through the use of GPS devices, trip routing, and receiving information on traffic blocks on a real time basis became commonplace. Electronic maps are constantly being supplemented by new and useful opportunities. It is not improbable that in the near future teaching about geography will be hardly thinkable without satellite maps. Education of children will have more the semblance of a game than of a lesson, but at the same time quantity and quality of the examined information may far exceed the norms established by the school curricula.